With two-position control, the final control element may be in only one of two positions. These two positions are sometimes called on/off or open/closed. Consequently, it is often called on-off control. Two-position control is used in many systems, such as heating and air conditioning, water heaters and ovens. In the example, two-position control is the mode of control. The measured variable is the temperature of the process and the final control element is a steam valve. Because this system uses two-position control, the valve can be in only one of two positions – usually these are fully open or fully closed. Therefore, when the temperature of the process falls below the set point, the valve will open completely (100%). When the temperature rises above the set point, the valve will close completely (0%). The instruments used for two-position control are usually inexpensive, rugged and foolproof. In a process using two-position control, the value of the controlled variable will fluctuate around the set point. In the example of the steam heating process, the temperature repeatedly rises above and falls below the set point. Theoretically, the steam valve would have to open and close continually to maintain a constant temperature at the set point. This would cause too much wear and tear on the equipment. Instead, two-position controllers usually have a dead-band or dead-zone. The dead band is a range of values around the set point. When the controlled variable is within this range, no control action takes place. The dead band reduces wear and tear on the equipment, particularly on the final control element without a dead band, the final control element would cycle continuously. Dead band is described as a plus (+) or minus (-) about the set point. 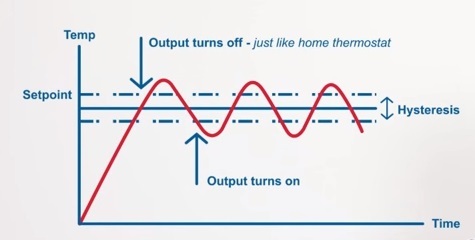 For example: The set point is a temperature of 100oC and the steam valve opens at 97oC and closes at 103oC. You would describe the dead band as +/- 3o C around 100o C set point.